"Among the active, energetic farmers of Humphrey township is numbered Joseph Brockhaus, who is living on section 31. He arrived in this county when a youth of fifteen years, his birth having occurred in Wisconsin, February 2, 1861, his parents being G. H. and Annie G. (Summers) Brockhaus. He began his education in the schools of his native state and there had the usual training of the farm lad, remaining in Wisconsin until 1876, when he came with his parents to Platte county, Nebraska. He has always remained with his parents but started in business independently at the age of twenty-five years, when he took charge of the home place, which he has since cultivated, his father turning over two hundred and forty acres to him at that time. He now has a splendidly developed farm on which are lacking none of the accessories and improvements of the model farm of the twentieth century. He has added to his original holdings by the purchase of one hundred and twenty acres adjoining, so that he now has an excellent farm of three hundred and sixty acres situated on section 31, Humphrey township. He afterward bought two hundred and twenty acres on section 3, Humphrey township, which is also improved and which he rents. His work has been carried on along systematic lines, and the results of his carefully and intelligently directed labor are seen in the success which has crowned his efforts, his five hundred and eighty acres of land being the visible evidence of a life of well directed energy and thrift. He is also a stockholder in the Farmers Elevator Company of Humphrey and of the Farmers State Bank there. On the 16th of February, 1886, Mr. Brockhaus was joined in wedlock to Miss Josephine Fangmann, who was born in Kentucky, June 7, 1808 a daughter of Anton and Carrie Fangmann, who were natives of Germany. Mrs. Brockhaus, passed away March 18, 1909, after an illness of only four days, her death being a matter of deep regret to her many friends as well as to her relatives and immediate family. She had become the mother of nine children: Mary, the wife of John Wemhoff, a resident farmer of Idaho; Annie, the wife of August Weiser, who follows farming in Humphrey township; Gertrude, the wife of Edward Weiser, a resident farmer of Grand Prairie township; and Lizzie, Katie, Johanna, Frank, Ferdinand and Theresia, all at home. The Catholic church claims the allegiance of Mr. Brockhaus, who has been a lifelong member thereof. He gives his political support to the democratic party but aside from casting his ballot in defense of its principles is not an active politician, for he does not seek nor desire office as a reward for party fealty. On the contrary, he prefers to concentrate his energies upon his business affairs and, working persistently along the lines of modern farming, he has become one of the most prosperous and progressive agriculturists of his part of the county." Joseph and Josephine (Phinie) Fangman Brockhaus were married on February 16, 1886 and farmed Section 31 of Humphrey Township. Phinie died on March 18, 1909 when she was only 40 years old. Joseph Brockhaus, Resident of Community for 66 Years, Passed on at 1:20 A.M. Sunday. One by one they leave the scenes of their early struggles, their joys and their sorrows, their successes and their failures, and pass on to a land that is filled with everlasting happiness. That is the story of the pioneers of this community, of the men and women who came here when this was nothing but barren prairie inhabited by Indians, of those who had faith in the productivity of the land of this section and through hard work, frugality and perseverance developed the community to its outstanding place in the farming communities of the country. The last one of those to have answered the final call was Joseph Brockhaus a resident of this community for 66 years. He answered the call at the home of his son, Frank J. Brockhaus, a mile south of this city, at 1:20 a.m. on Sunday morning, Dec. 27, he having been bedfast for ten weeks, having suffered from carcinoma of the esophagus. Joseph Brockhaus, a son of the late G. H. and Anne G. (Summers) Brockhaus, early pioneers of the community, had lived long among us. He was born on the second day of February, 1861, near Hollandtown, Wisconsin. His parents being farmers, as a young lad he learned the occupation of farming, and occupation he followed throughout his life. In 1876 his parents left Wisconsin and came to this section of Platte county, settling on a farm two miles south of this city. Here they remained for two years when they moved onto the farm which is now occupied by the son of the deceased, Frank J. Brockhaus, where Mr. Brockhaus lived for 64 years. On February 16, 1886, he was united in marriage to Miss Josephine Fangman, the wedding having taken place in St. Francis church in this city. The couple continued to make their home on the farm of his parents, which he had purchased and they made that their home throughout their life. Both being thrifty and energetic they added to their holdings as the years went by. Mrs. Brockhaus died on March 18, 1909, and since that time Mr. Brockhaus made his home with his son, Frank. Five children preceded him in death, Mrs. Ed. Wieser on Nov. 24, 1918, Mrs. John Zach on May 30, 1942, and three children in infancy. Surviving are the following children: Mrs. John Wemhoff, of Cottonwood, Idaho. Mrs. August Wieser of Rosholt, S.D., Mrs. Helmuth Thomas of White Rock, S.D., Mrs. Ed. German of Hankinson, N.D., Ferd Brockhaus of White Rock, S.D., Mrs. Victor Hamling of the St. Mary's community and Frank Brockhaus of this community. He is also survived by one sister, Mrs. Vincent Wieser, Sr., of the St. Mary's community and 64 grandchildren and 21 great-grandchildren. The departed was baptized and reared in the Catholic faith, and in his humble way endeavored to live his life in the tenants of the teaching of that faith. It was 9 a.m. on Wednesday morning that funeral services were held for the repose of his soul at St. Francis church, the edifice being filled to its capacity by relatives, friends, and neighbors who had come to pay their lat respects, the large gathering testifying the esteem in which the departed was held. Rev. Father Albert Limacher, pastor, officiated at the requiem high mass, at also at the short services at the parish cemetery where his remains were laid to rest beside those of this wife. Active pallbearers were his three grandsons, Stanley Zach of this community, Lawrence Wemhoff and Lawrence Wieser of Rosholt, S.D., and three nephews, Jos. Fuchs of this community, Frank Wieser of Dumont, Minn., and Dr. J. F. Brockhaus of Madison. Honorary pallbearers were all old friends and neighbors, Jos. Bender, Jos. Keller, Conrad Fuchs, Felix Krist, Frank Krings and Albert Rollman. Members of the St. Joseph's Men's Society and the Third Order of St. Francis, of which the deceased was a charter member, attended the services in a body. The funeral arrangements were made and conducted by the Duesman Mortuary of this city. Those here from a distance to attend the funeral were Mr. and Mrs. August Wieser and son, Lawrence, of Rosholt, S.D., Mr. and Mrs. Ed. 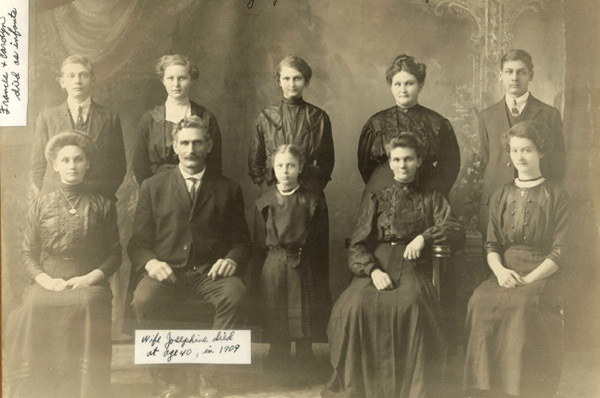 German of Hankinson, N.D., Mrs. Helmuth Thomas and Mr. and Mrs. Ferd Brockhaus of White Rock, S.D., Mr. and Mrs. Allie Hoffman and daughter and Mr. and Mrs. Julius Hoffman of Pierce, Mr.s Jos. 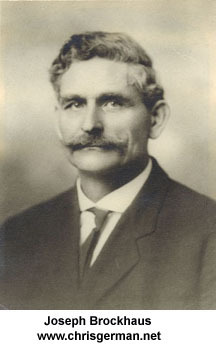 Fehringer of Peetz, Colorado, Mr. and rs. Frank Wieser of Dumont, Minn., Mr. and Mrs. Nick Brachle and Mr. and Mrs. Frank Koch of Petersburg, Mr. and Mrs. Art Jockum of Norfolk, Mr. and Mrs. Wm. Dittrick of Battle Creek, Mr. and Mrs. Leonard Wemhoff of Duncan, and Dr. and Mrs. J. F. Brockhaus of Madison. One daughter, Mrs. John Wemhoff of Cottonwood, Ida., was unable to be present on account of the illness of her husband, and one other relative Mrs. Wm. Tophorn, of Templeton, Ia., was also unable to be present. Mr. Brockhaus was a quiet, unassuming man, devoted to his family and his home and an eye single to their comfort and happiness. He was a man of strong convictions and also of sterling worth who took life seriously; was a hard working man, honest in his dealings and lived and died enjoying the esteem of those with whom he had associated throughout the 66 years of his life in this community. Lovely flowers, tributes of love and esteem, covered the casket of our friend, who carried through the good and bad times, drought and depression with faith in the goodness of the soil and climate of his native state, and with the assurance that God reigns and doeth all things well, has passed from the activities of the war-torn world to the peace he has richly earned and which passeth all understanding. May God rest his soul and may He bring peace and joy again into the hearts of the loved ones he has left behind."